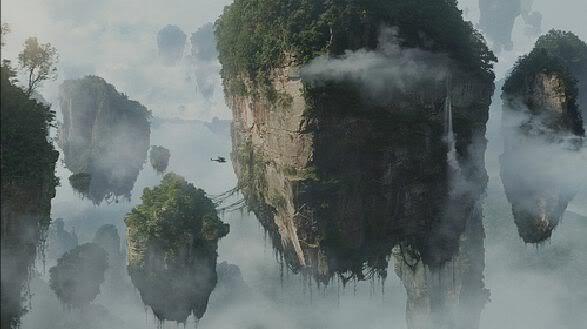 Many people came to ask me after watching Avatar if I had worked on the movie or if I had noticed the similarities between my personal work and the strange floating rocks in the movie (see below). So here is the weird coincidence: 13 years ago, when Avatar was still in embryo state, I went to Digital Domain to meet with the guy who was going to be the Production Designer on the movie. After seeing my portfolio, he wanted to hire me to work on it. Unfortunately, Avatar went back on the shelves for several years, and that was the end of my hopes. Well, it would be easy to connect the dots, and say that Cameron possibly at that point kept the concept of giant floating rocks in mind, and that the idea was eventually visualized in Avatar. But the truth is, first of all my floating rocks don't look exactly the same, although some of them look pretty close. Second, I wasn't the first person to paint floating rocks. As a matter of fact, Rene Magritte or Roger Dean did that a long time before I did. I would even say that Avatar took directly from Roger Dean's concepts, not only in the landscapes, but also in some other aspects (look at the dragons, and tell me if there are similarities with Roger Dean's dragons...). Same thing with how the pilots choose their dragons and vice-versa: go read "Dinotopia" from James Gurney, and you'll be surprised. In any case, I still think Avatar is a great movie. I absolutely loved it. I just wish I had eventually worked on it, like I was supposed to. On the other hand, the giant floating rocks was a concept I wanted to develop further in a personal story project. Well, I guess I'll have to modify my original concept now... But after all, isn't it what real creativity is all about: constantly reinventing new concepts? 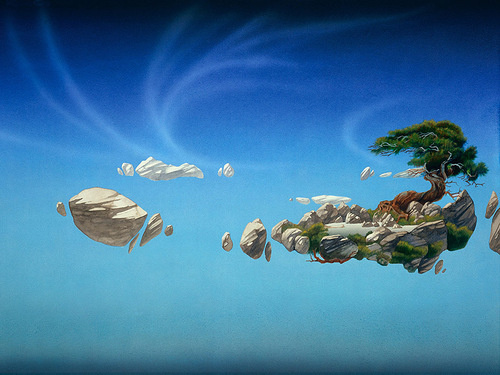 Images below: Avatar (the movie); Roger Dean's "Flight of Icarus"; René Magritte's "Castle in the Pyrénées".